The Cumberland & Dumfriesshire Farmers Mart PLC had forward 4,257 store lambs at their weekly sale at Longtown on Tuesday 8th September 2009. Another great show easily maintained recent high rates. Top of £60.50 for Texels from The Close, others £57 The Hagg, £55 Nilston Rigg; Suffolk £52 Kilnford Croft; Greyface £51.50 Bog, £49.50 Rotherhope, £49 Cooks House; Hill Cheviot £50.50 East Deloraine, £49.50 Catslackburn; Beltex £50 Winterhope; Bleu d’Maine £50 Solwaybank; North Country Cheviot £50 Puncherton and Gillespie Farm; Cheviot Mule £47.50 Commonside; Lleyn £45.50 Templand; Blackface £42.50 Sewing Shields, £38.50 Harsondale, £38 Auchengruith; Swaledale £27 Naddle, £26 Merryknowe. 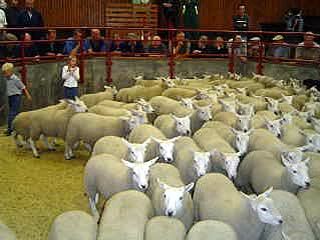 Included in the sale was the first sale for Hill Cheviot lambs when there was 898 forward. With trade up £15.08 on the year to average £48.24 overall. Top was £50.50 East Deloraine, £50 Puncherton & Gillespie, £49.50 Catslackburn.